It’s hard to believe that Amber Heard’s last notable cover appearance on a fashion magazine was for Marie Claire back in December 2015. Allure now reminds us of Amber’s existence with the newly unveiled cover for December 2017. This has been a monumental year for Allure with a string of successful covers, including a diversity issue, an anti-anti-aging issue and a cover starring hijab-wearing model Halima Aden. 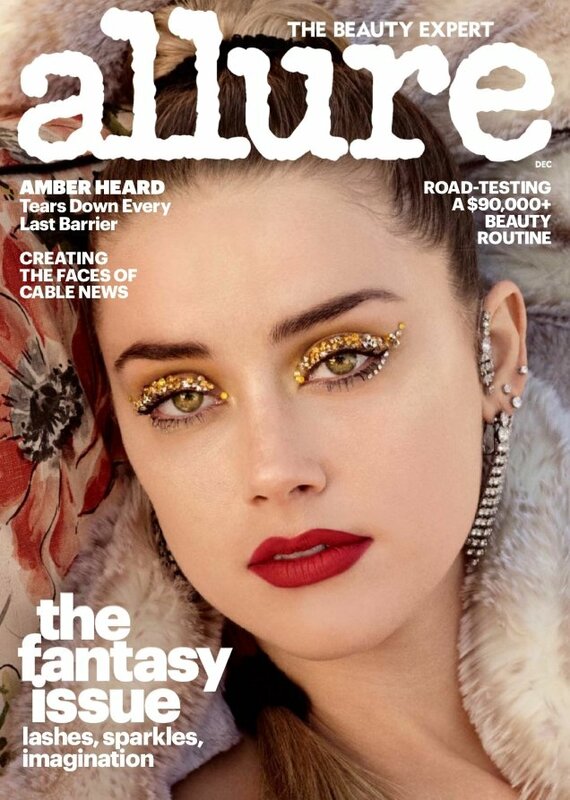 Unfortunately, Allure‘s latest disappoints with a close-up of a bejeweled Amber, photographed by Daniel Jackson. Our forum members weren’t here for it. “Didn’t even realize this was her,” exclaimed 333101 the moment the cover struck. “I think the new Allure is allergic to glamour, instead they churn out looks more suited to getting wasted at a music festival. Amber already looks like she is,” wrote an uninterested tigerrouge. “I find her beautiful and I love a good close-up but this is awful,” confessed KateTheGreatest. Jexxica felt the same way. “I love Amber and I was excited about it when I read her name but I hate what they did to her here. A more natural look would have been fantastic in that close-up,” she wrote. “Amber looks festive and fantasy, but not the layout. White simply wasn’t the right choice here. Why not Gold or Bronze? I do like that Allure adopted some of the ill-fated Russian edition’s campiness, even if this close-up reminds me of Kerry’s cover,” pointed out Benn98. Care to see more? Take a look at Amber’s cover shoot and join the conversation here.